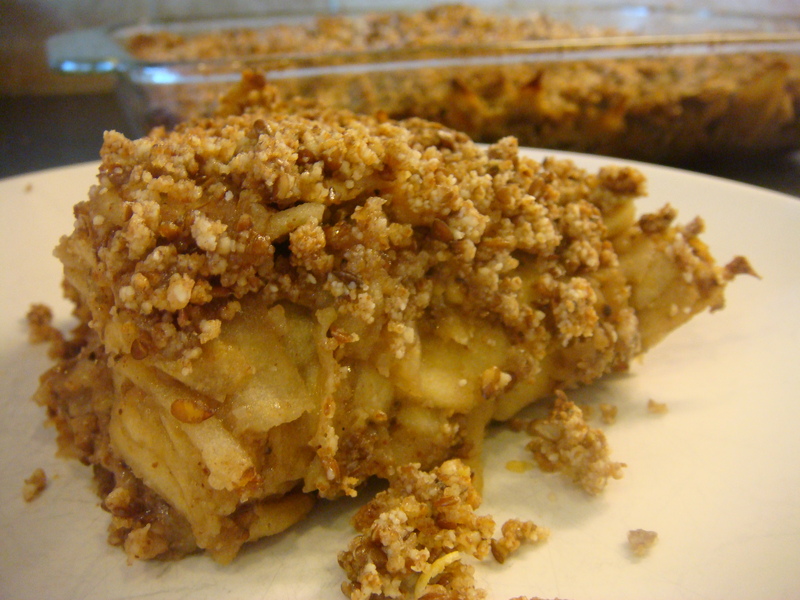 Call it what you like: Apple Brown Betty, Apple Crisp, Apple Crumble. Whatever you call it, this version is a remake of the sinful one that most of us are probably familiar with. It is not only gluten free but free of grain, dairy, eggs, soy and refined sugar. I used dates that I ground up in the food processor as the sweetener. It is total comfort food minus all the guilt. Low carb? Maybe not but it is low on the glycemic index and a whole lot lower carb than the original version. All five of us loved it. Ron didn’t even know it was sugar-free. I knew he liked it when he kept making passes through the kitchen to grab just one more bite. Pre heat oven to 350 degrees. In a food processor add almonds, flax seeds, salt and cinnamon. Process until it is as fine as it can get. Add dates and process again until well incorporated. Add coconut oil and xylitol and process until blended well. When you pinch it between your fingers it should stick together loosely. If it doesn’t, add a bit more coconut oil. Reserve approx 3/4 cup of the topping. With remaining mix spread out evenly in a glass baking pan. (I used the glass Pyrex one that is one size smaller than the 9×13, maybe it’s 8×10?? It says 2 L on the bottom.) Gently press down but don’t pack it firmly. Set aside. In a clean food processor add both the oil and the dates and process until you end up with a paste. Set it aside. I used a mix of granny smith apples and fuji because that is what I had on hand. Peel, core and thinly slice the apples. I used my food processor to do this so it was super fast and the apples are uniformly sliced. In a large bowl combine date paste, apples, cloves, salt and xylitol. With your hands combine everything. Keep mixing until the date paste is uniformly distributed. Taste it to see if it is sweet enough for your liking. You can add more xylitol if needed. Spread apple mixture over almond crust evenly. Then sprinkle remaining almond crumble over top. Cover with foil and bake for 45 minutes. Remove foil and bake another 15 minutes. Serve warm or cold. This would be great with ice cream or sweetened whipped cream but then it isn’t vegan any more and it is no longer guilt free. We had it alone and like I said we all loved it. The kids had no idea that this was actually good for them. I think mom scores a point for this one. Oh, wow, this looks good. It looks better than regular Apple Crisp. I’m definitely going to make this sometime this week. I just baked this today, but I didn’t have xylitol so I used stevia. The stevia left it with too much of an aftertaste, so I wouldn’t recommend it. Unless, the measurements are lower than xylitol. Otherwise, it turned out nice. I agree about stevia. I can’t stand the taste of that stuff. This sounds amazing, but I’m trying to keep my carbs low, too. Ideas for making this without the dates? Do they add only sweetness? Can I adjust with xylitol or is there a texture component, too? Yes the dates are there for sweetness. You can probably do this without them and adjust with xylitol if you don’t mind the flavor. I just used dates, less oil and a variety of nuts and no added sweetener . Very good. Loved the topping on the bottom. Apples could have used a little added time in oven, but that is often the case.